At least 47 people have been killed in an attack by pro-government militia in the embattled Syrian city of Homs, according to human rights activists. Women and children are said to among those who were reportedly tortured and killed on Sunday night in the neighborhood of Karm el-Zeytoun. The Syrian government acknowledged the deaths, but blamed “armed terrorists”. The attack happened hours after UN-Arab League peace envoy Kofi Annan ended his two-day mission to Damascus. 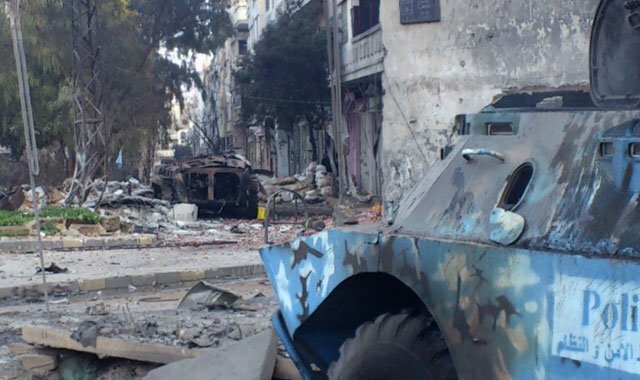 Homs has been under assault for weeks as government forces have tried to root out rebel fighters. Parts of the city are devastated. The main opposition group, the Syrian National Council (SNC), has called for an emergency UN Security Council meeting to discuss the killings, the AFP news agency reports. Hundreds of families fled the Karm el-Zaytoun area of the city on Monday after reports of the attack in their neighborhood overnight, the British-based Syrian Observatory for Human Rights said. One activist in Homs, Hadi Abdallah, told the AFP the bodies of 26 children and 21 women were found, some with their throats slit and others bearing stab wounds. Both the opposition Syrian Revolution General Commission (SRGC) and the Local Coordination Committees (LCC) put the toll at 45. The SRGC said that some of the victims had been burned alive with heating fuel poured over them and others had their necks and limbs broken. Mulham al-Jundi, an opposition activist and member of the SNC, said Karm el-Zeytoun was experiencing a military bombardment similar to the one seen in Baba Amr district in recent weeks. He said government troops were firing rockets from tanks outside the neighborhood, then going in “and killing the families who stay inside these areas”. Reports are difficult to verify because of tight restrictions on independent media operating in Syria. Footage posted on YouTube, said to show the bodies of men, women and children killed in the attack, made for grim viewing. In one video, at least 11 bodies can be seen, including at least four young children covered in blood, he adds. Syrian state television accused “armed terrorist gangs” of carrying out the killings, saying the bodies had been filmed in an effort to discredit the government. Both the LCC and the British-based Syrian Observatory for Human Rights blame the pro-government Shabiha militia for the attack. The Shabiha has been blamed for many of the atrocities carried out since the uprising began nearly a year ago. Activists say their presence has allowed the government to deny any involvement in the most brutal actions against protesters. Kofi Annan left Syria on Sunday after two days off talks with President Bashar al-Assad, saying he was “optimistic” that a peace deal could be found. He said he had presented Bashar al-Assad with “concrete proposals” to bring an end to the bloodshed, but gave no hint that a deal was imminent. Syria will be on the agenda when US Security Council foreign ministers meet in New York later.